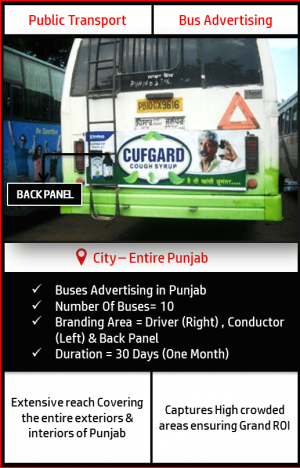 Now Advertise on Punjab Roadways buses at affordable & best prices. 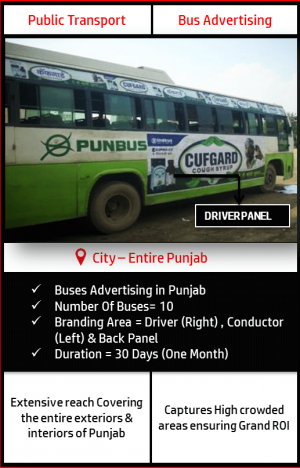 Extensive reach with an Advertising Campaign on Punjab Roadways Buses covering the interiors & exteriors of Punjab. Branding on 10 PUNBUS buses with 30 days duration of the Ad Campaign. High display area since almost entire bus is covered with 3 sides display of the client’s brand i.e. Driver Panel (Right Panel), Conductor Panel (Left Panel) & Back Panel. Exposure to highly crowded areas of the city. The client has to choose the depots where the buses belongs to. 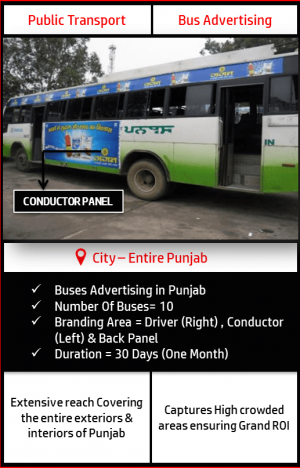 The complete list of depots with their routes would be shared at the time of booking and then the client can choose number of buses in the selected depots. At least 5 buses has to be taken from each depot selected. Branded buses images will be shared prior Campaign startup. The Images with complete information i.e. Registration No., Number Plates etc. will be shared after execution. The cost of Printing & Mounting is extra and has to be borne by the client. BMK printing and mounting rates for Buses Advertising are quite nominal and best in the business. Approximate Display Area is 153 Sq. Ft. including the Driver, Conductor & Back Panel. The exact display area would be confirmed at the time of booking. BMK needs to be intimated 15 days in advance if creative needs to be changed. Maximum 15 days time would be needed for full execution of the campaign from the date the package is bought. The vehicles on the move covers almost the entire area & even those restricted areas where Hoardings and Billboards are totally banned. Public vehicle stands on the most crowded Place of the City which results in the ultimate Branding of the Client even when the Vehicle is standing at one place. The medium creates an eye Catching impact on the viewers mind which consequently grabs the attention of massive road users. Quite flexible in terms of duration of the campaign (Highly Recommended for long term campaigns).